As of 1907, female graduate students were officially admitted to Johns Hopkins. Women wishing to attend the School of Arts and Sciences, however, were still refused admittance, and usually were referred to the Woman’s College of Baltimore (now Goucher). Women were always welcome in the various part-time programs, brought together in 1909 as a separate division of Hopkins, and they could earn bachelor’s degrees there. But many women still felt excluded from full participation in undergraduate activities. On two occasions – in 1925 and in 1952 – Hopkins attempted to abolish the undergraduate curriculum and admit students at the junior level to work toward graduate degrees, bypassing the undergraduate degree entirely. In at least one instance, a woman was admitted under this plan but was unable to complete the full graduate program. In recognition of her accomplishments, the university awarded her a bachelor’s degree, but this remained the exception to the rule. By the 1960s, many universities that had been “men only” were either becoming coed, or were feeling pressure to make the change, as women campaigned for inclusion in the undergraduate student body. “Student unrest” became a fact of life on many campuses, and student demands were not entirely limited to protesting government actions in Southeast Asia. While Hopkins never experienced the level of protest seen at Columbia and Berkeley, there were those here who pushed for change. Sensitivities were shifting, to the point that it was difficult to justify excluding women. “Unequal marriages,” “threatening a woman’s health,” and “a life fundamentally different from that of any man” (see Part 1 on Coeducation) seemed much less valid reasons than in the past, as women’s role in society gradually changed. In 1969, a committee of students, faculty and administrators convened to discuss undergraduate coeducation and they recommended admitting undergraduate women. The Academic Council next took up the question and voted in favor of coeducation on October 29. On November 10, 1969, the Board of Trustees approved a resolution admitting women undergraduates. Upon this action, President Lincoln Gordon appointed a task force to explore all aspects of the issue and determine what additional services would be needed, and what would be the impact of coeducation on athletics, housing arrangements, etc. 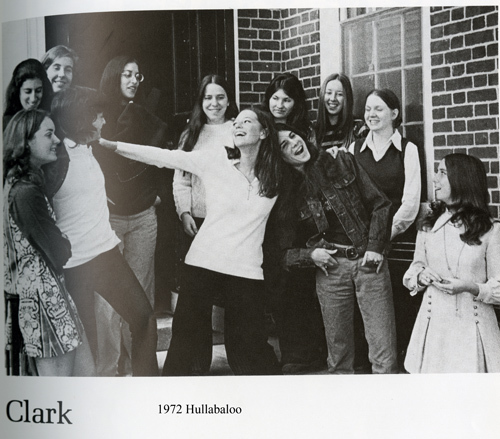 Although the dormitories were not adapted for women until 1971, in September 1970, ninety undergraduate women arrived on campus. Many were transfer students living in off-campus apartments, while others were freshmen living at home. Things did not always go smoothly, due in part to the administration’s policy, voiced by Dean George Benton, of “Let’s get what we need when we need it.” Essentially, it was left up to the women to bring problems to the administration’s attention and justify needed changes (and their expenses). 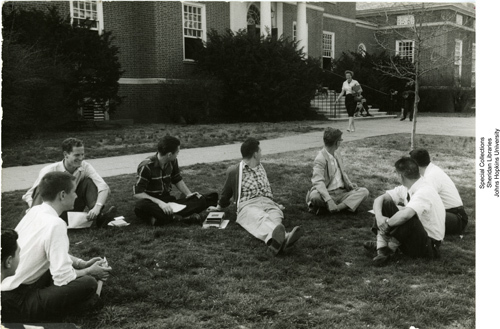 From an historical perspective on forty-one years of undergraduate coeducation at Hopkins, it has not been easy, especially for the self-described “pioneers” of the 1970s. For any small group pushing for acceptance, there is the feeling that ‘good is not enough; you must excel to be considered an equal.’ Slowly, the ratio between women and men approached and then surpassed 50/50 (53/47 as of 2010-11). When I talk to undergrads today, many are surprised that coeducation is a relatively recent phenomenon; they assume that such a basic equality has always been in place. But even Daniel Coit Gilman, a man of vision and brilliance in many areas, might not have foreseen the day when women would be the equals of men in the academic world. I am indebted to Julia Morgan, former Archivist and now Associate Secretary of the Board of Trustees, for her writing on this subject in 1986. Congratulations Johns Hopkins Hospital! For the 20th time!